This January I had the exciting opportunity to attend and present at the British Psychological Society Division of Clinical Psychology Conference in Manchester. Now I am not a clinical psychologist, so some may find my attendance odd, my background is philosophy, teaching and counselling and psychotherapy. However since I decided to go into Private Practice I have tried to learn from all who work in the various associated fields of mental health. I will talk later about my specific workshop on Bi identities but I do think it is important that for all the current talk of hierarchies in the SCoPed no one at the conference treated me as a “mere” counsellor but as a fellow highly qualified and knowledgeable professional. Identity seems finally to have become visible to those in the talking therapies. For so long the focus was always on the individual, but in a way which erased that which makes us individuals. Systematic oppression was often dismissed in a “just try harder” approach, and gender, sexuality, race, disability, class and other identities barely touched upon in training or in practice. The keynote speech at the conference was given by Professor Tom Shakespeare. He spoke, among other things, on the vital difference between being identified as and identifying as. The difference between identities which are embraced and identities which are imposed. Or, as a popular meme puts it, the difference between a cat sitting in a box, and trying to put that cat in a box. A lack of appreciation of this difference has led some to claim “they don’t see labels” an attitude of erasing differences and structural oppression which rather than bringing about equality encourages inequality. 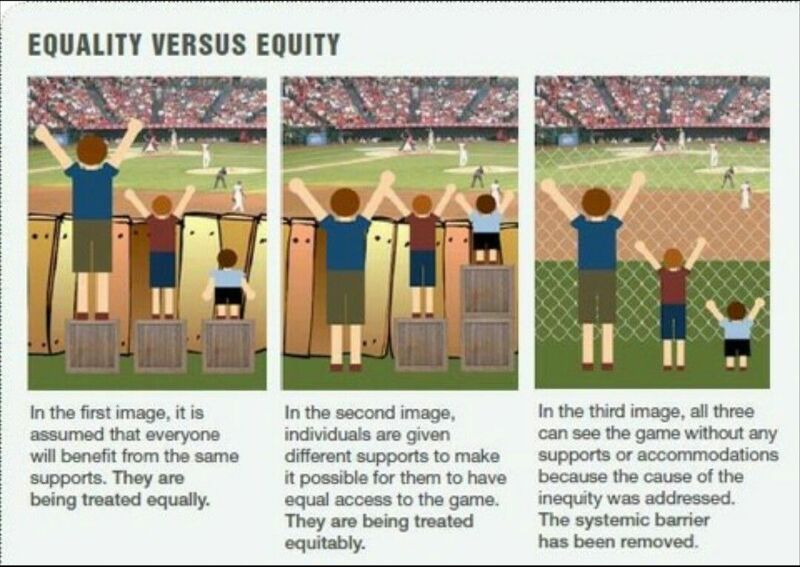 What I find most interesting about this visual representation of structural barriers is that it is very often shared without the third image. We are it seems more comfortable with offering support to an individual than considering which structures need to be dismantled to truly allow equity to exist. In order to construct the new do we have to reconstruct the old or is it a continuous process? The self is constructed and continually under construction. Perhaps they resonate with me because this is how I see the therapeutic process, not a hierarchical progress towards self actualization but a continual process of becoming, and being at peace with that which we are becoming. In the LGBT symposium where PHD students presented their research I was struck by the fact that data still suggests young LGBT people are struggling with this process in the face of a hostile world. But it may be that this is not a uniquely LGBT process, that all of us, with our unique identities, privileges and oppressions, need to find ways to navigate the continual process of being who we are. In my next post I shall focus specifically on my workshop – Neither Fish nor fowl, the problems faced by Bi+ people when working with mental health professionals. Previous What Les Mis can tell us about science and identity.